These Butter-Pecan Pumpkin Squares would be a nice alternative to Pumpkin Pie. They have a good base and the filling stays moist and is very similar to pumpkin pie filling. 1. To prepare base: Combine sugar, flour and butter in a bowl with pastry cutter until crumbly. Press into 12 x 8 x 2 inch greased baking dish. Bake in preheated oven for 8 to 10 minutes until slightly browned and puffed. Set aside to cool. 2. 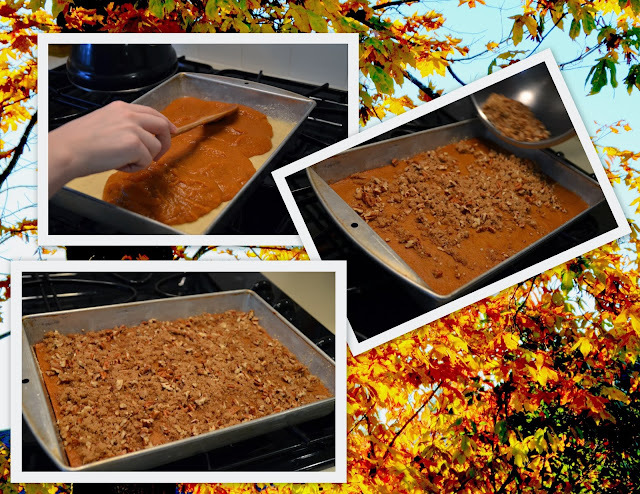 To prepare filling: Combine pumpkin, milk, eggs, sugar, cinnamon, nutmeg, and salt with electric mixer until smooth. Pour over baked crust. Bake in preheated oven for 30 to 40 minutes or until slightly firm. 3. To prepare topping: Combine brown sugar and butter in small bowl with pastry blender until crumbly. Add nuts and stir to mix. Sprinkle over pumpkin filling and return to oven for about 10 more minutes until mixture is bubbly and browned. 4. Cool thoroughly before cutting into squares. Yield: Approximately 36 squares, 2 by 2 inches. Wow...do they ever look yummy. Sounds like a nice flavour combination and just at the time when we are starting to think of baking for the holidays. Thank you for sharing. Have you ever tried to freeze these? They look wonderful. Yep - those look delicious! They look like some Southern Pecan Bars I make--usually only at Christmas--but I always consider pumpkin to at least add some nutritional value and vitamins so this is a great addition. My pecan bars have corn syrup in them like a mini pecan pie bar. I will be anxious to try these. Just wondering. Could you use pumpkin "pepitas" instead of pecans for people with nut allergies or would that throw off the taste? could I replace the flour with something wheat/gluten free? any suggestions? they look amazing!